Maybe you’ll be surprised, but if you’re looking for a screen recording software, Xeoma is there to meet your requirements too! Whether you’d like to control your kids computer activity, or get to know what your employees are up to in the office – Xeoma will be your great screen recording software. You can record step-by-step instruction for tutorial videos. Your grandparents can’t find pictures folder on their computer and need your help? Just send them a video of you showing them the way on your screen, this will be easier and more effective. Maybe you need to grab a video from your own computer screen for a presentation? Go ahead and use Xeoma screen recorder for this purpose too. Connect module “Screen Capture” instead of “Universal Camera” module. Then you can add “Motion Detector” to the chain of modules in order to record when there is motion on the screen only. All other modules can be used with screen recording for your convenience. So a little preparation and here you have your own screen recording software. In some cases you will want to run it secretly. 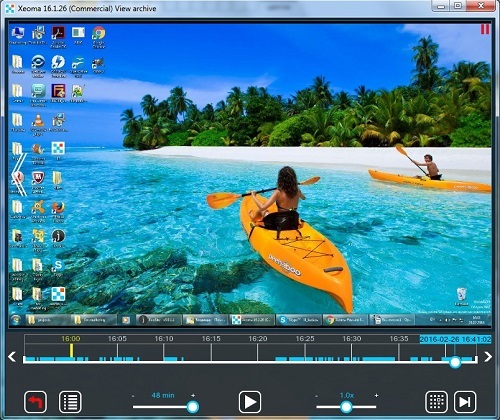 Just choose to work in hidden mode while installing Xeoma screen recording software.